Its eclectic atmosphere, friendly staff and bold flavors have made BA a Jonesboro favorite over the years. 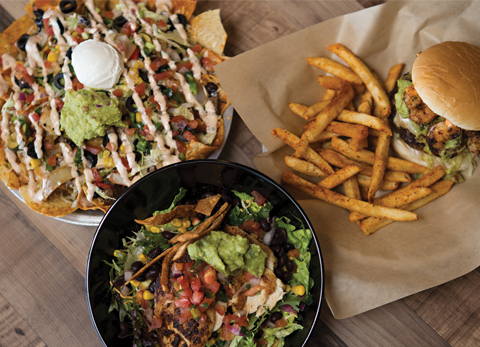 In recent months, owners Dr. Dan Johnson and Bill Blakely revamped the popular eatery by giving the interior a new look and more space, while also expanding the menu. Johnson, a native of California, and Blakely, a native of Northwest Arkansas, both have several years of working in the food industry under their belts. Upon moving to Jonesboro in 1996, Blakely began working for Chef Omar Barry at 501 Steakhouse. Johnson, who has lived in Jonesboro off-and-on throughout his life, gained his experience while working at several restaurants in Chicago and New Orleans. Johnson and Blakely met a year prior and came up with the idea of a Tex-Mex, build-your-own bar kind of establishment, since it seemed to be the latest trend in food businesses at the time. Upon opening its doors in April 2007 under the name BA Burrito, the locally-grown business quickly became a Jonesboro hot spot. As time went on and the food options began to expand, both Johnson and Blakely decided to change the name of the business to BA Eats. Now, several years later, the establishment is solely known as BA after its recent re-branding. “Our goal at BA has always been to create a customized, local dining experience using the freshest quality of food and original hand-crafted seasonings,” said Blakely. After its renovation, customers walking into BA will be greeted by the new and improved food bar located inside. At the bar, guests can customize their burritos, tacos, nachos, salads, quesadillas and more with an array of freshly-made ingredients. Guests can choose from several types of proteins, toppings and sauces to add to their meals, creating their own unique flavors. Two fan-favorite BA items that have been secretly served for the past several years have finally made their way to the new menu. The biggest change at BA began in March of last year when interior renovations got under way. These renovations will now allow the business to have both a take-out side and a dine-in side. As for the future of BA, both Johnson and Blakely have high hopes for their locally-grown business. Blakely says they would like to expand BA, including new menu items, better serving the community and even expanding its footprint. “BA’s future is extremely bright,” said Johnson. “We certainly have our eye on expanding locations within Northeast Arkansas and regionally. BA is located at 405 Southwest Drive and is open from 11 a.m. to 9 p.m. Monday through Saturday and 11 a.m. to 3 p.m. on Sunday. To stay current on weekly specials and to see the latest updates, call (870) 336-7325 or find BA on Facebook.